It is hard to believe, but today we are celebrating CORE’s second anniversary. It is often said you can’t appreciate how far you have come without knowing where you once were, so in honor of today we are taking a look back. CORE opened on August 22, 2011 in a little room at the Village Fitness Center with only a few clients, a couple of pieces of equipment and a driving passion to help people recover and thrive. We were small, but we were mighty and it was not long before a few clients turned into a few more and we outgrew our space at Village Fitness. The doors to CORE’s new home opened in November 2011 and our new facility quickly became a place we all love. More space also meant more equipment and we were blessed to be able to offer clients the new RT600 Step and Stand, the LiteGait Body Weight Support System with treadmill, the Hypergravity Vibration Plate and the SCI Fit Upper Body Ergometer. This new arsenal to combat the effects of paralysis had our client base working harder than ever on their recovery goals and was an exciting time for our training team as they expanded their knowledge and expertise to better serve our clients. 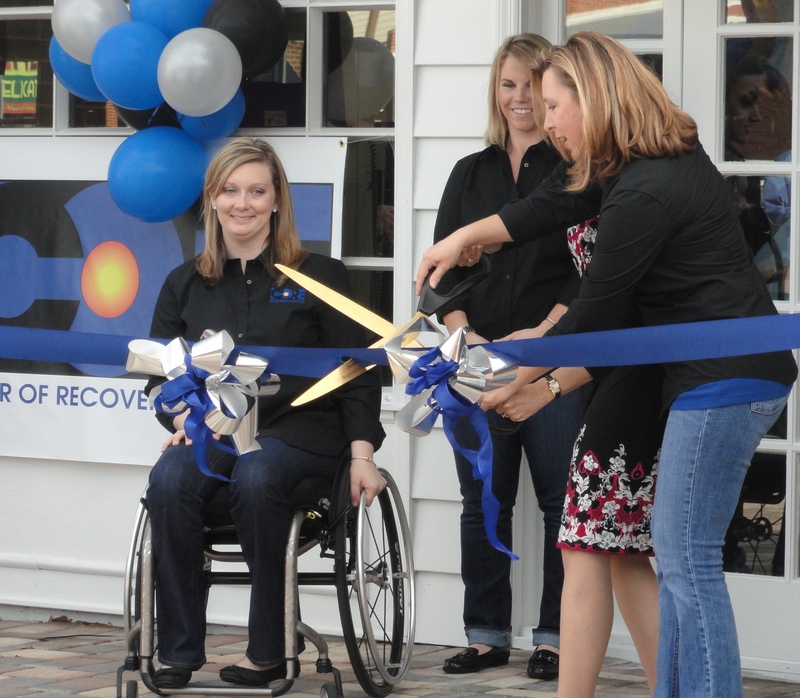 In February 2012, we officially held our Grand Opening and welcomed our community to tour the facility in an effort to create awareness about neurorecovery. It was quite the success and we were so proud to show everyone around. 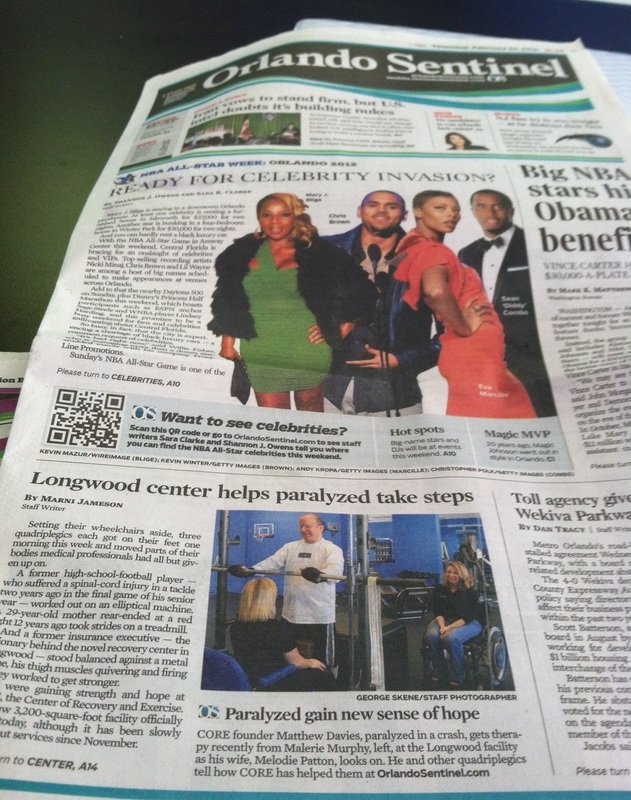 We even made the cover of the Orlando Sentinel that day! Our front page cover of the Sentinel! That same month we also saw the CORE training team grow with addition of Paul Rodenbeck, who was a former intern of Malerie and Ronnie’s. Paul was a perfect fit for CORE and our clients have gained immeasurable benefits from working with him. In addition to his training, Paul has helped CORE successfully grow our Internship and Externship Program. CORE + Paul = Awesome! Paul has tackled growing our Intern/Externship Program. Also, in 2012 the CORE Foundation developed the Scholarship Program to assist individuals who are financially burdened gain access to our advanced neurorecovery program. To date, the CORE Foundation has helped over a dozen individuals receive over 700 hours of therapy! That translates into a lot of recovery goals being achieved thanks to the awesome work of our Foundation board, our staff and our amazing clients! And, we can’t talk about 2012 without mentioning the arrival of Ronnie’s lil cutie pie! CORE loves you, Rylie! We’re only in August of 2013, but just like our clients, we won’t stop!!! This year our staff has grown even more to include new assistants Luis Morrisette, David Patton and Colby Perry. Richard Bodden also joined CORE as our newest exercise physiologist. That is a lot of muscle, ladies and gents! Colby & Richard getting loco with client Kaitlin! We’ve also added the RT 200, the AlterG Anti-Gravity Treadmill and the ReWalk Exoskeleton to our facility, which was of course featured on our awesome billboard over I-4! Everyone in I-4 traffic loves the CORE billboard! The future and the possibilities are endless for CORE, the training team and our clients. We are so incredibly grateful for each and everyone of you who has been a part of this amazing journey. Thank you, thank you, thank you! Now, let’s get to work! We’ve got more goals to reach!